It’s been three months and I need a new KURO-Bō stick… where can I buy one? Easy – you can just order your new KURO-Bō stick online. Where can I purchase KURO-Bō Activated Charcoal – instore and online? Take a look at the “Where to Buy” page on this website ? I know most tap water has fluoride in it and that it’s good for me – does KURO-Bō Activated Charcoal remove it? No, because the fluoride molecule is so extremely small, it doesn’t actually bond with the KURO-Bō stick in any significant way. I like that KURO-Bō Activated Charcoal is 100% natural, but what about its packaging? 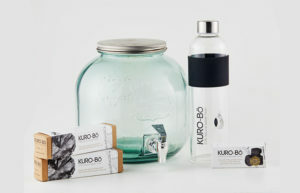 Just like our KURO-Bō product, the KURO-Bō packaging is all 100% biodegradable and recyclable! Where does the wood for KURO-Bō Activated Charcoal come from? KURO-Bō Activated Charcoal is made using an indigenous hardwood from Laos, and the branches are harvested from forests that are carefully maintained and managed by experts. Why is activated charcoal sometimes called ‘white charcoal’ when it’s actually black in colour? The reason activated charcoal is also called ‘white charcoal’ is because, during the creation process, it is covered in a mixture of earth, sand and ash, which gives it a temporary whitish hue – and this has led to it also being known as ‘white charcoal’. How many sticks of KURO-Bō Activated Charcoal are there in a package? You’ll find one stick of KURO-Bō Activated Charcoal per package, which you can use for up to three months. Can I use a KURO-Bō stick to filter… say vodka? Well… let’s just say stick to filtering water for now, shall we? Weird question, should the KURO-Bō stick float in my water container? Not weird at all actually. Most sticks of KURO-Bō won’t float, although if it does, it just means it’s a little more porous than others, but it won’t make any difference to the filtering process (i.e. its adsorption capability). And just to pre-empt your next question – yes – you can drink from your water container while your KURO-Bō stick is still in there! I’ve found that tap water sometimes just tastes worse in different places. Will KURO-Bō Activated Charcoal still work even if the water tastes really bad? The good news is yes it will! In fact, it can significantly improve the taste of the tap water, by removing toxins and enriching it with beneficial minerals. Can KURO-Bō Activated Charcoal kill off all germs and bacteria? Although Binchotan is known to remove a number of chemicals, viruses and bacteria, we definitely don’t recommend using it to filter untreated water. Stick to using it for filtering drinking tap water instead. Will KURO-Bō Activated Charcoal work in hot water? Yes it will. In fact, many people like to add a KURO-Bō stick to their bath to remove toxins and benefit from the enriching minerals it releases. The Japanese have been using binchotan for centuries in cooking rice as it removes impurities in the water and helps retain the taste of the rice. What happens if I open the KURO-Bō packaging and the stick is not in one piece? Do not fret! As activated charcoal sticks are uniquely 100% natural and every tree/branch has its unpredictability and nuances in terms of structure, grain and porosity, fractures can and will happen. This is absolutely fine (albeit the stick looks different!) and will in no way affect the filtration and mineralisation efficacy, or 3 month longevity of the charcoal. What sort of toxins does activated charcoal remove? KURO-Bō is proven to remove significant levels of toxic heavy metals and chemicals like: lead, aluminium, copper, iron, chlorine, mercury and manganese, as well as E. coli (tested at 99 CFU per 100ml). 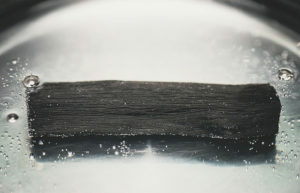 Plus research also widely suggests that activated charcoal helps to remove many other impurities such as viruses, other bacteria, pesticides, cancer-related Total Trihalomethanes (TTHMs), chemical run-off, pharmaceuticals and antibiotics, as well as ethylene, acetic acid vapour and hydrogen from the atmosphere. Apparently it can even absorb electromagnetic waves and radio frequencies! What sort of minerals does KURO-Bō enrich water with? 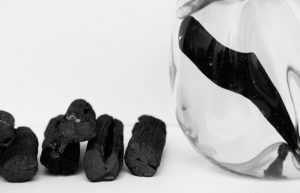 KURO-Bō enriches water with many of the beneficial minerals that were originally stored in the living hardwood tree from which it was created. These include Magnesium and Calcium, and it neutralises pH as well. Binchotan is also known to releases Potassium and Phosphorus. When I took the KURO-Bō stick out of the packaging, I had black on my fingers. Will the stick leave soot in the water, or a funny texture in my mouth? Absolutely not. Don’t forget that KURO-Bō is natural and nearly 100% solid carbon. Charcoal is by nature, black and a little dusty. Any small residue on your fingers will quickly wash off, and the boiling process removes the other surface residue. Once it begins filtering, nothing at all will be released into the water and, don’t worry, your KURO-Bō stick will never, ever dissolve. There may be a very small amount of flaking, but this is completely harmless. Can I use KURO-Bō Activated Charcoal in plastic water bottles? Yes, it is possible. But, in keeping with KURO-Bō’s 100% natural and recyclable ethos, we do recommend using glass containers instead. You might want to take a look at our beautiful, hand-blown 100% recycled carafes. How long does a KURO-Bō stick take to filter 2lt of water? The KURO-Bō stick actually begins filtering water immediately, although for best results, we recommend allowing it to rest for at least 6 – 8 hours, or overnight, either at room temperature or in the fridge. I drink A LOT of water a day, so how often should I be reactivating my KURO-Bō stick? The longevity of each KURO-Bō stick depends on the quality and the quantity of the water being filtered. So we suggest sticking to a schedule of reactivating your KURO-Bō stick once a month – and, if you find (sooner than later) that your water no longer tastes as clean and fresh as it should, you can always boil your stick for another five minutes, or if you are in the third month, replace your KURO-Bō stick a little sooner. It’s a natural product, so trust your instinct! Do I need to clean my KURO-Bō Activated Charcoal? Nope. The preliminary boiling stage will remove the light black residue, and because the toxins in the water bond to the KURO-Bō stick at a molecular level, any impurities will remain attached for as long as you use it. How many sticks of KURO-Bō will I need per litre of water? We recommend one Regular stick of KURO-Bō per every 2lt of tap water. How long do I need to boil a stick of KURO-Bō to activate / reactivate it? Just 10 minutes is all you need to activate – and reactivate – your KURO-Bō stick each month. Where should I keep my KURO-Bō filtered water? In the fridge? At room temperature? You can keep your KURO-Bō filtered water in the fridge – or out. It just depends on how chilled you like your water really… In fact, many users like to keep a couple of sticks in their 4 litre fridge water dispensers (see images on the How to Use page). Should I use KURO-Bō Activated Charcoal in conjunction with other water filters? Not unless you like wasting money… With KURO-Bō Activated Charcoal there’s absolutely no need to buy other expensive (or plastic) water filters. Just one stick of KURO-Bō can give you delicious, 100% naturally purified, filtered water for up to three months! Does KURO-Bō Activated Charcoal affect the pH level of water in any way? It does, but in a good way. KURO-Bō Activated Charcoal actually helps to balance the pH, thereby softening the water and improving its taste. So how does KURO-Bō Activated Charcoal actually work? Simple! During KURO-Bō’s creation process, it becomes carbonised, as well as highly porous, which significantly increases its surface area, which in turn allows it to adsorb and naturally bond with toxins, in order to remove them, while enriching water with beneficial minerals. This means it acts as a natural filter and improves the taste of your ordinary tap water. Is KURO-Bō difficult to use? Not at all! In fact, all it takes is just four simple steps, which you can find . How do I know when my KURO-Bō stick isn’t filtering anymore? Providing you are following our KURO-Bō Lifecycle Guide, if your water doesn’t taste as clean and refreshing as it should at any stage, it likely means it just needs a little boost! In the first and second month, just try boiling your stick again for 5 minutes to open the pores again. In the third month, it likely means it’s time to recycle and replace! Should I throw the KURO-Bō stick away after 3 months? Absolutely not! One of the best things about KURO-Bō is that it is 100% recyclable. So even though you’re not using it to purify water any more, you can still use it in any number of fantastically useful, eco-friendly ways! Is there any special way that I need to look after my KURO-Bō Activated Charcoal? Not at all! Aside from reactivating it once a month to keep the KURO-Bō stick’s pores open, simply keep your KURO-Bō stick in your water jug, carafe or bottle, and let it work its magic. How long does KURO-Bō last? While this will depend on the volume of water being purified, as well as the quality of the water, you can in fact use a single KURO-Bō stick for up to three months!